Chrysanthemum comes from Greek word 'Chrys' meaning golden (the colour of the original flowers), and 'anthemon', meaning flower. This name was given to it by Carolus Linnaeus, a Swedish naturalist who is also known as the father of modern taxonomy. 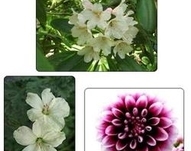 The Chrysanthemum flowers bloom in various forms, and can be daisy-like, decorative, pompons or buttons. Chrysanthemum blooms come in a huge variety of shapes and sizes and in a wide range of colours. In addition to the traditional yellow, other popular colours are white, purple, and red. The Chrysanthemum flower symbolizes fidelity, optimism, joy and long life. Each Chrysanthemum flower head is actually a cluster of many flowers, composed of a central group of short disk flowers surrounded by rings of longer ray flowers. Chrysanthemums are classified into nine categories according to the type and arrangement of disk and ray flowers - Incurved, Reflexed, Intermediate, Late Flowering Anemones, Singles, Pompons, Sprays, Spiders/Spoons/Quills, Charms and Cascades. For example, the 'reflexed' Chrysanthemum consists of ray flowers that curve downward into an umbrella shape; the 'quill' has tubular ray flowers that radiate from the centre of the head.